In addition to its famous fountain and picturesque setting, Point State Park is also the starting point for one of Pittsburgh’s best not-so-secrets. If you set off from the Point and head southeast for more than 300 miles, you will eventually reach Washington, D.C.—that much is obvious. What’s not as apparent is the fact that there is a bike trail between the two cities that more than 1 million brave riders conquer every single year. In 1973, construction started on a deserted train track with the hopes of turning it into a 150-mile bike path from Pittsburgh to Cumberland, Maryland. It wasn’t until 40 years later, in 2013, that it ran between those two points continuously. 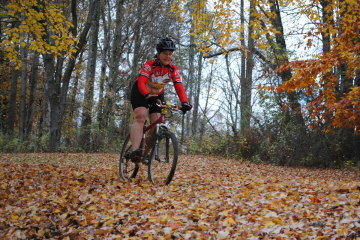 This trail is called the Great Allegheny Passage (the GAP). 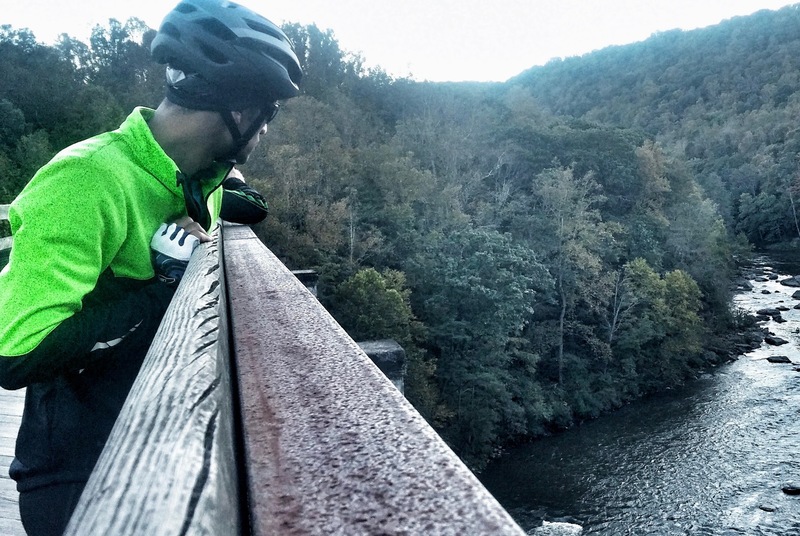 In Cumberland, the GAP meets another bike trail—the Chesapeake & Ohio Canal Trail (the C&O)—which continues another 183 miles to Washington, D.C. The metaphorical start of the Great Allegheny Passage is the tip of Point State Park. 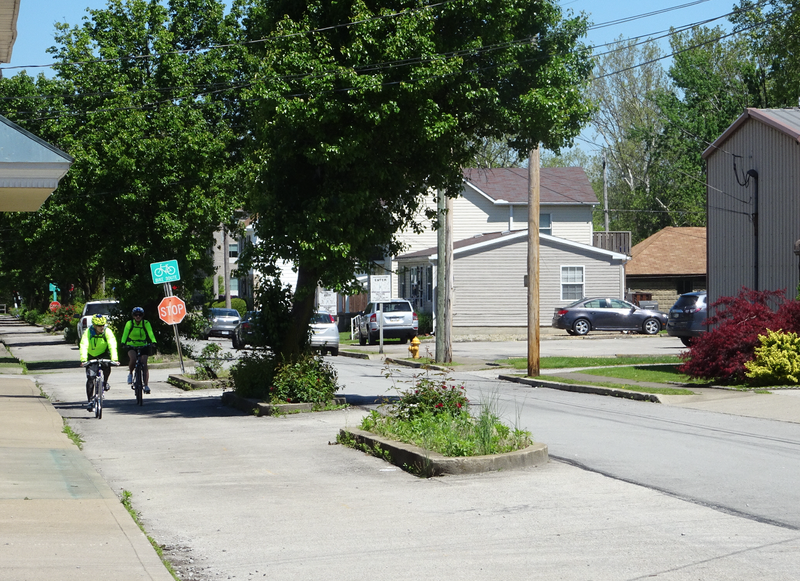 Physically, no real bike path begins until the Three Rivers Heritage Trail picks up near Grant Street and First Avenue. 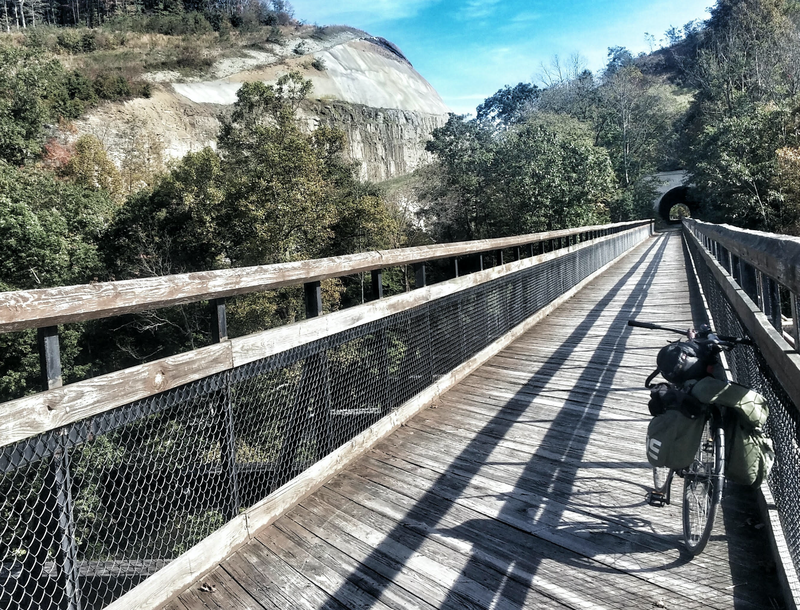 This trail crosses over the Hot Metal Bridge and melds into the Great Allegheny Passage as it winds down the Monongahela River. Just 36 miles outside of Pittsburgh, West Newton is a worthy first stop on the trail. For those taking a slower pace, there are sleeping accommodations, and for those continuing on, spots to grab lunch. West Newton is a sleepy town, but exploration through its small streets can yield sights of many turn-of-the-century buildings. 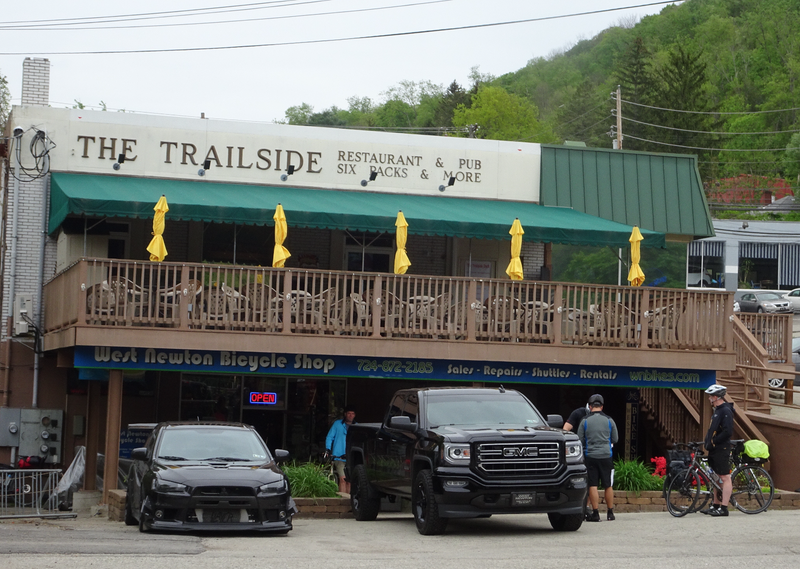 The Trailside is the first big watering hole on the GAP outbound from Pittsburgh. The spot is famous along the trail, and most riders stop there for a meal, and sometimes a beer. The sweet potato waffle fries with warm pecan butter cannot be missed. The outdoor deck provides ample space to mingle with fellow riders. Attached to the Trailside is a bike shop and a six-pack shop. Good news: West Newton boasts a craft brewery. Bad news: It’s only open two days a week. If you’re in town on a Wednesday or Saturday night, consider stopping by Bloom Brew for a drink from one of their 24 taps. The Bright Morning is a complex of several Victorian homes located just off the trail. It is a popular place to stay in West Newton with views of the river and the trail. For those who choose to camp along the way, Cedar Creek has picnic tables and fire rings. Connellsville was once bustling with shops, trolleys and movie theaters, and double the number of residents it has today. It fell into a slumber for a number of years, but the emergence of the GAP has helped revitalize the economy. Connellsville is only 14 miles from Ohiopyle. 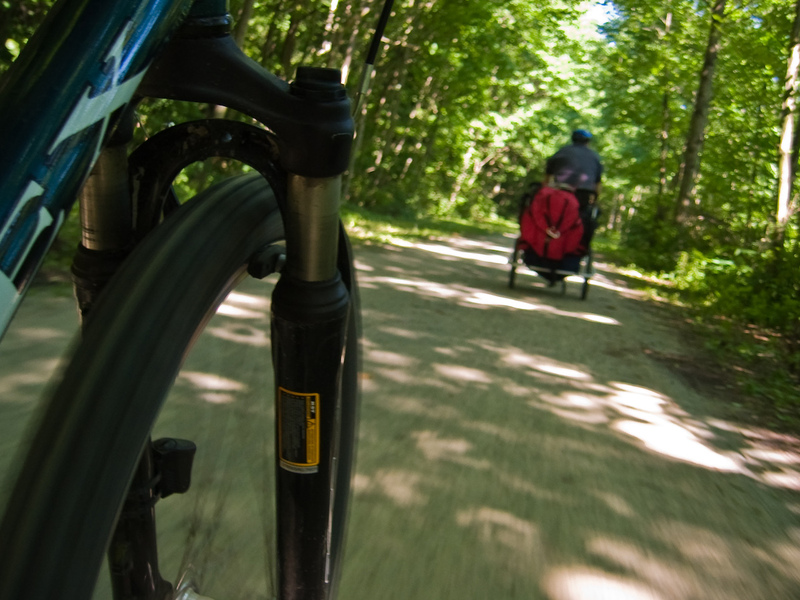 Many riders spend the night there and ride into Ohiopyle early the next morning to explore. About a mile off the trail is Bud Murphy’s, the local sports pub and watering hole. If a hometown game is on, all the better. Greenhouse Winery, a Pennsylvania winemaker, has a tasting room in Connellsville. The spot does tastings, sells bottles and, best of all, makes wine slushies, which are refreshing after a long ride. This new hotel in the area offers comfortable rooms, a swimming pool and free breakfast. Connellsville resident John Woodruff made history at the 1936 Olympics in Berlin when he won a gold medal in the 800-meter sprint. As an African-American runner in Nazi-occupied Germany, Woodruff was a hero when he returned to the United States and received an Oak tree seedling from Germany’s Black Forest for participating in the game. The tree, which now stands more than 80 feet tall, is located by the Connellsville High School Stadium, where he trained. The Connellsville Canteen is a small cafe that serves as a museum for the original Connellsville Canteen, which operated during World War II. This canteen was located by the rail tracks, and local women fed troops who passed through town—24 hours a day—from 1944 to 1946. The museum features memorabilia and stories of local war veterans. The lush town of Ohiopyle is commonly hailed as a highlight of the GAP. Not only do the quaint streets provide numerous food and lodging options, the entire area is surrounded by Ohiopyle State Park. Fuel up before hitting the trail at this small bakery in town. 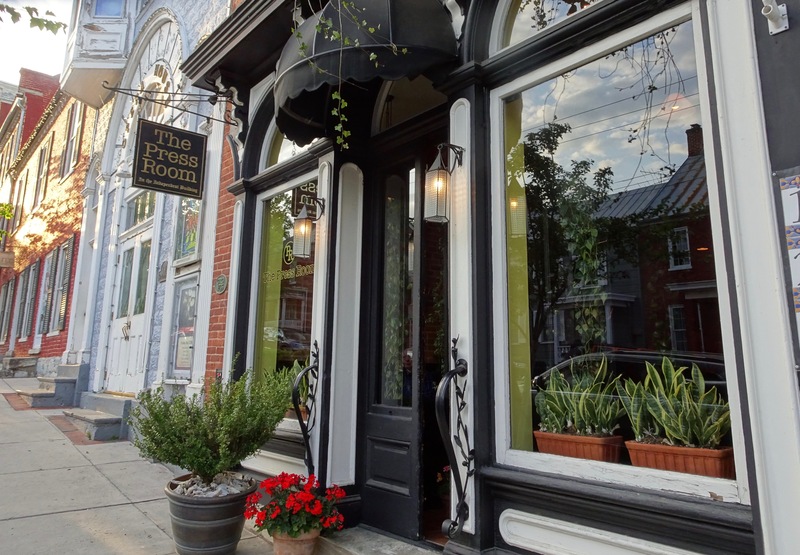 Known for their fresh food and friendly staff, the Ohiopyle Bakery and Sandwich Shoppe serves up hearty meals and sweet treats like pies and cookies. 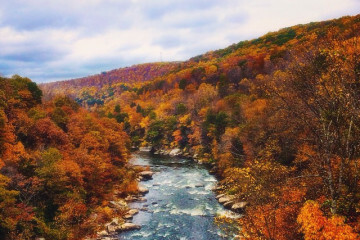 Ohiopyle State Park is nearly 20,000 acres of preserved wilderness filled with trails, waterfalls and stellar views. Try to make it to Cucumber Falls, Baughman Rock Overlook and the Ferncliff Peninsula. Adventure seekers should organize a rafting trip, as the area is famous for its rapids. A particularly unique feature of Ohiopyle State Park is the Meadow Run Natural Water Slides. Visitors have the opportunity to slide through a 100-foot sandstone channel. The ride is bumpy, unpredictable and an absolute blast—but take caution when sliding along the rocks! 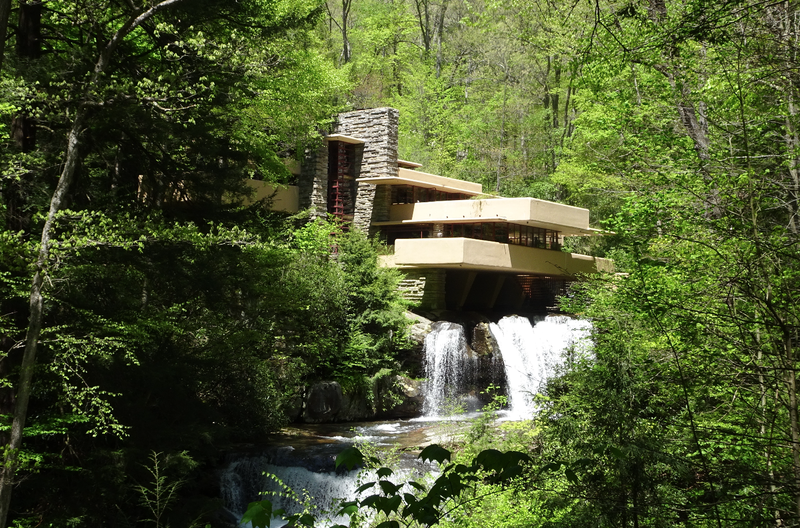 Fallingwater, one of the most iconic structures designed by famed architect Frank Lloyd Wright, is located just four miles outside of Ohiopyle. The house runs tours every day except Wednesday. The path up to the house is not particularly bike-friendly, so if you’re staying in town, it may be easier to arrange transport through your accommodations. Kentuck Knob (another Frank Lloyd Wright design) is also close by. Following Ohiopyle, the GAP becomes long and remote, but also contains some of the most stunning views on the entire trail. A highlight of this section is the Salisbury Viaduct, a former 1912 railroad bridge that runs high above fields and forests for nearly 2,000 feet. Meyersdale has been known as the “Maple City” since the Monongahela Native American tribe first settled the land and harvested syrup from the trees. The town holds an annual Maple Festival in March. Donges is known for having the biggest pancakes in town, and in a place famous for its maple syrup, that’s something not to be missed. Stay in the mansion of turn-of -the-century coal and timber baron Levi Deal. This Victorian home has been converted into a stunning bed & breakfast. For those camping, the Maple Festival Campgrounds takes guests from May to October. The grounds have hot water and fire pits. The Eastern Continental Divide, located 23.5 miles from Cumberland, Maryland, is the highest point on the trail at 2,392 feet above sea level. This point marks the divide between the watershed that heads to the Atlantic Ocean and the watershed that heads to the Gulf of Mexico. Cumberland is the meeting point for the Great Allegheny Passage and the C&O Trail, which continues 184 miles to Washington, D.C. It is the logical “halfway” point for the ride. 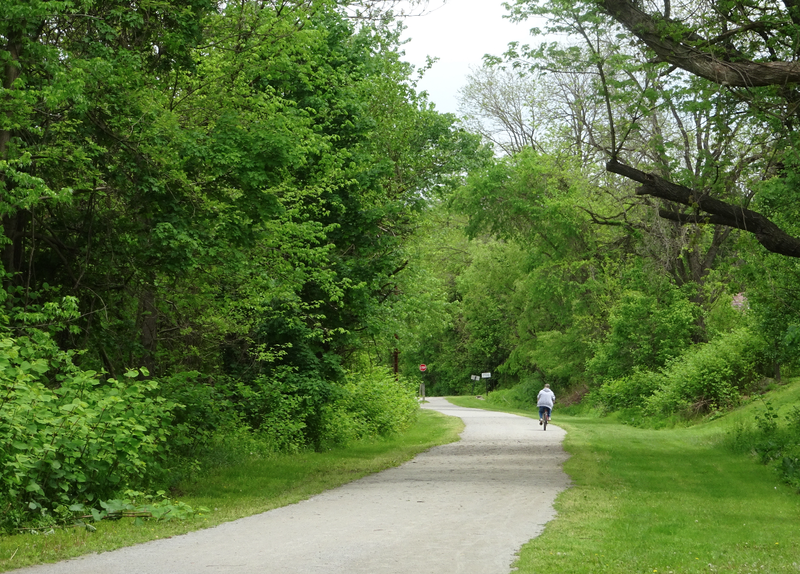 If you’re continuing onto the C&O after completing the GAP, visit the Canal Museum to learn more about the history of the Chesapeake & Ohio Canal Trail. No rider ever forgets their trip through the Pawpaw Tunnel. This canal tunnel is nearly one mile long and is pitch black for the majority of the ride. (Bring a headlamp.) The thrill is heightened by the fact there is an empty canal next to the trail. 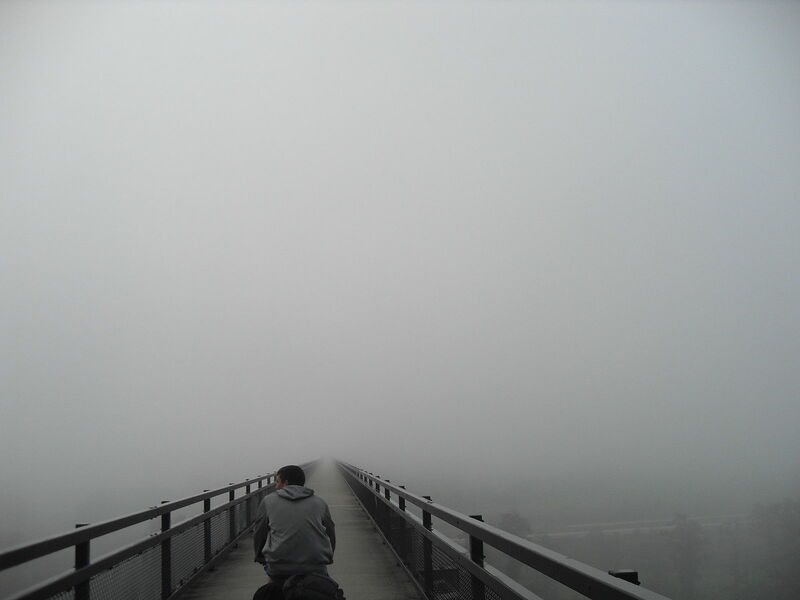 After you exit the tunnel, it is possible to climb on top of the exit and enjoy a view of the area. A cruise through Hancock, Maryland, pulls riders even deeper into America’s history. Hancock is one of the oldest towns in the region and is famous for its 1862 siege by Stonewall Jackson. In addition to the town’s quaint restaurants and antique shops, there is a small museum that provides more information on the rich history of the town. Located just off the trail in Hancock, this small bed and breakfast is the perfect crashing point for GAP riders. With a wraparound porch and vintage dining room, there’s plenty of space to relax with a view. Additionally, secure bike storage is available.